The Vault America open file management backup process enables the backup of almost any file utilizing our Open Document Manager (ODM) application technology. This technology allows our CS-Client application read level access below the operating system where application level locks reside. Email has quickly become the single most widely used feature of the Internet, and many companies consider it a critical communication tool. Lost or corrupted emails can cause significant damage, including irretrievable business loss. For customers utilizing Microsoft Exchange, the Mailbox Level Backup & Restore tool facilitates and enables pre-determined levels of email backups and restores, ranging from an entire Exchange info store, to a single user’s email box. Vault America provides the “hot” backup of a Microsoft SQL 2000/2005 database or MS Exchange 2000/2003/2007 Information Store without installing software or ‘plug-ins’ on the server where the application resides. In addition, the “hot” backup functionality allows a backup of the application without having to be taken offline to get a complete backup (including transaction logs) of a chosen database or information store. To complete this process Vault America has embedded Microsoft certified API calls into the CS-Client that allows the software to interact directly with the application data engine and request a duplicate data stream of the application data. This duplicate stream contains the necessary information for a full backup without having to stop the application or ‘dump’ the application data. Vault America provides secure Blowfish or 256-bit AES encryption to safeguard the privacy and confidentiality of your file transfers for mission critical data onto secure storage networks at Tier 4, SAS70 Type I & Type II data centers within the US or Canada. All client data resides in its encrypted format behind firewalls. In addition, the Data Vaults reside in a secure state-of-the-art co-location facility with redundant internet bandwidth, power, and backup generators. Physical access to our data vaults is guarded by three separate pass key entrances and each Data Vault is within a locked cabinet. Complete redundancy for bandwidth and power are a mandatory requirement for all facilities in which Data Vaults are located. For example: The primary Data Vault maintains 12 separate bandwidth providers for constant internet availability and capacity. 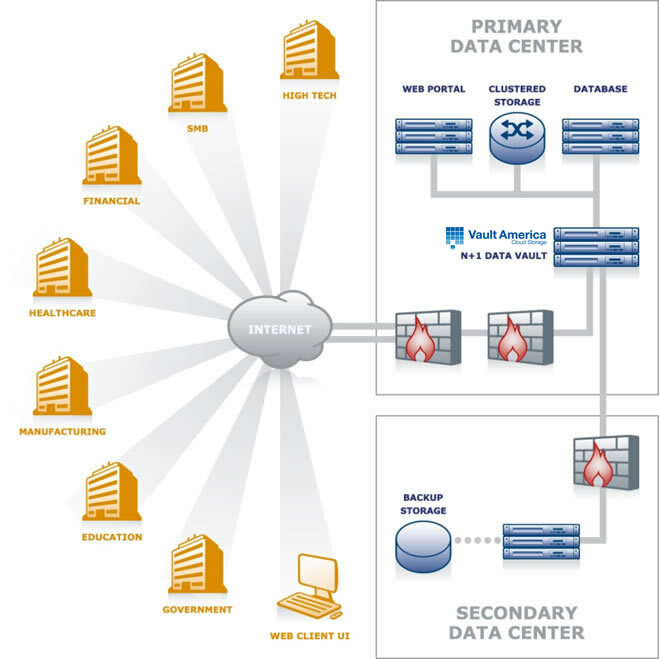 In addition, dual conduits in to the building for both power and bandwidth are utilized. Power is support by UPS, battery backup and diesel generators and utilizes and automatic transfer switch to transfer power in the event of an emergency. Upon request, Network Access can lock down a client’s account to a certain public IP range or even to a single IP address. This adds an additional level of security for our clients and prevents someone from stealing the machine with the software and trying to gain access to our data vaults from outside the company network.